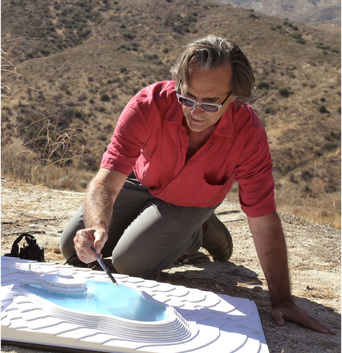 ​​Production Designer Toby Corbett with the white paper model of the Ranch House set for the feature film Broken Horses.​ The set was built over an artificial lake created by Corbett's team at Polsa Rosa Ranch in Acton California. Los Angeles based Production Designer Toby Corbett has designed major film and television productions in the Untied States and around the world, working with such renowned American directors such as John Sayles, Walter Hill, Kathryn Bigelow and Wayne Kramer. Corbett has also worked with many noted international filmmakers working in the states. He designed Kihachi Okamoto’s last film, East Meets West, Hiroaki Yoshida’s Iron Maze, Werner Herzog’s Bad Lieutenant: Port of Call New Orleans, Vidhu Vinod Chopra’s Broken Horses, and Kieran Darcy Smith's The Duel. After receiving a Bachelor of Arts degree in Film and Theatre from the University of Washington Corbett began working in regional theater as a scenic artist for the Seattle Repertory Theatre and A Contemporary Theatre. Later, as a design assistant at the Mark Taper Forum in Los Angeles, Corbett was fortunate enough to work alongside such acclaimed designers as Academy Award® winner Tony Walton, Tony Award winner John Lee Beatty and Tony Award nominee Ralph Funicello. Moving to New York City allowed Corbett the opportunity to establish himself as a scenic designer for numerous off-Broadway productions. Noted productions include The Rivals and June Moon, at Manhattan Punch Line and the American premiere of Pirandello’s Cap and Bells at the Judith Anderson Theatre, produced by noted Broadway producer Frank Gero. Corbett’s success as a scenic designer in the theater was the catalyst for his career as a Production Designer for television and film. His design work for television first gained notice while working with Tracey Ullman on her HBO show Tracey Takes On, resulting in three Primetime Emmy Award nominations. As a feature-film production designer, Corbett is known for his work with writer/directors John Sayles (Silver City, Honeydripper) and Wayne Kramer (The Cooler, Running Scared, Crossing Over). Other noted collaborations include Kathryn Bigelow’s Blue Steel, Robert Townsend’s The Meteor Man, Ron Nyswaner’s The Prince of Pennsylvania, and Walter Hill’s Bullet to the Head. Corbett has also been the production designer for the highly successful Pitch Perfect film franchise. Pitch Perfect 2 directed by Elizabeth Banks is the highest grossing musical of all time, and the highest grossing film by a first time director and a female director.